Rev. Mark L. Poorman, CSC, became University of Portland's 20th president on July 1, 2014. Prior to this role, Fr. Poorman served as executive vice president. As executive vice president, he had oversight for the divisions of University operations, financial affairs, University relations and student affairs. He is a professor of theology, teaching courses in Christian ethics and moral theology, and he was instrumental in the formation of the Dundon-Berchtold Fund for Moral Development and Applied Ethics which includes the Character Project and the Dundon-Berchtold Fellowships for students and faculty to explore ethics-related issues. Until he assumed the presidency, he served as pastoral resident in Schoenfeldt Hall. Fr. Poorman came to the University of Portland from the University of Notre Dame, most recently serving there as a member of the theology faculty and as vice president for student affairs. In that capacity, he was responsible for that university's residential life as well as other student services, activities and programs, including campus ministry, Notre Dame Security Police, the student activities office, the counseling center, health services, the career center, the Office of Alcohol and Drug Education, the Gender Relations Center, and multicultural and international student services. 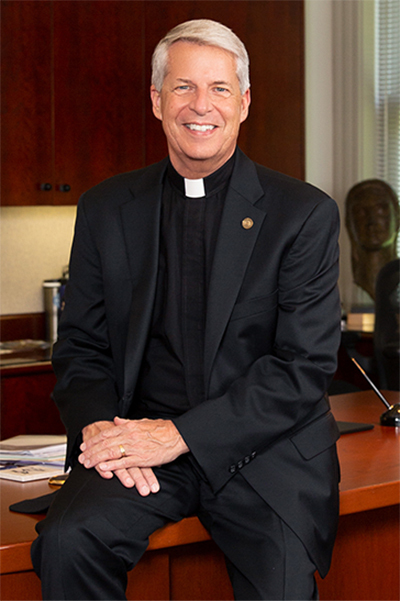 Prior to his appointment as vice president for student affairs, Poorman served at Notre Dame as executive assistant to the executive vice president and the president. Fr. Poorman graduated with a bachelor's degree in English from the University of Illinois. He is a member of Phi Beta Kappa. He earned a master of divinity degree from Notre Dame and was ordained a priest in the Congregation of Holy Cross. He later studied at the Graduate Theological Union in Berkeley, California, where he earned a Ph.D. in Christian ethics. He then returned to Notre Dame to serve full-time on the faculty of the theology department, directing the department's master of divinity program. Prior to his appointment as University of Portland's executive vice president, he served for seven years on the Board of Regents.